Novel Anticancer Agents offers pertinent basic science information on strategies used for the rational design and discovery of novel anticancer agents, and, in addition, translational studies involving clinical trial design and execution with these novel, mostly cytostatic agents. 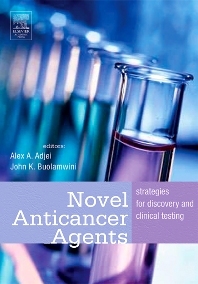 This book covers basic science strategies that are being used in drug discovery and preclinical evaluation focused on novel molecular targets, as well as clinical trial methodology including clinical pharmacokinetics and imaging to address issues of efficacy evaluation of the new, relatively non-cytotoxic anticancer agents. At present, there is no book that provides such an integration of basic and clinical studies of novel anticancer agents, covering both drug discovery and translational research extensively. Researchers in pharmacology and oncology (both government and industry), clinical oncologists who are in clinical research in universities or in industry, anticancer drug discovery and development scientists, research libraries, postgraduate students, fellows and general oncology practicing physicians. Section A: Strategies for Drug Discovery. A Survey of Novel Molecular Targets for Anticancer Drug Discovery. Microarrays: Small Spots Produce Major Advances in Pharmacogenomics. Strategies to Target Chemotherapeutics to Tumors. QSAR and Pharmacophore Mapping Strategies in Novel Anticancer Drug Discovery. Applications of Nuclear Magnetic Resonance and Mass Spectrometry to Anticancer Drug Discovery. Antisense Strategies for the Development of Novel Cancer Therapeutics. Antibodies and Vaccines as Novel Cancer Therapeutics. Inhibitors of Apoptosis (IAPs) as Targets for Cancer Therapy. Preclinical Testing and Validation of Novel Anticancer Agents. Section B: Methods for Clinical Testing of Novel Agents. Biologic Endpoints and Surrogate Markers for Ealry Trials of Novel Anticancer Agents. Improving the Efficacy and Safety of Anticancer Agents - The Role of Pharmacogenetics. Imaging of Pharmacodynamic Endpoints in Clinical Trials. Devising Proof of Concept Strategies in Oncology Clinical Trials. Clinical Trial Designs for Cytostatic Agents and Agents Directed at Novel Molecular Targets. 16 Cancer Gene Therapy Clinical Trials: From the Bench to the Clinic. Patient Accrual to Clinical Trials. University of Tennessee Health Science Center, Memphis, Tennessee, U.S.A.